We explored the association between patienthood and prevalence of symptomatology in the community. Base line data on prevalence were obtained through the use of a household survey. 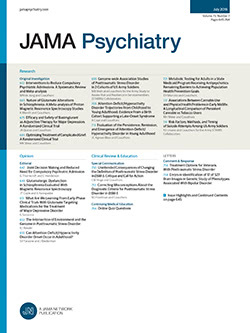 Characteristics of survey respondents (N = 938) and patients admitted from the surveyed area to a Connecticut Mental Health Center during a 12-month period (N = 808) were compared. High utilization of facilities was associated with the prevalence of symptoms in the community, particularly where defining characteristics were descriptors of disadvantaged social status. A second set of variables correlated with mental health center use but not with the prevalence of symptoms in the community. By and large, these characteristics describe a lack of social supports not necessarily related to social status. Finally, certain groups were underrepresented as patients even though comprising populations-at-risk in terms of levels of symptom impairment in the community.